Last night's performance of Charles Gounod's Romeo et Juliette soared with stunning singing and some mighty marvelous musicianship. The chorus (directed by the incomparable Susanne Sheston) sang with such fine French diction that not a word was missed. The orchestra, under the baton of Harry Bicket, captured all of Gounod's nuance. This was a co-production with the Fundacio del Gran Teatre del Liceu in Barcelona. The opera was making its first appearance at The Santa Fe Opera. Gounod's success with Faust some 8 years earlier was arguably matched by this adaptation of the play by William Shakespeare by the same librettists who adapted Goethe's masterpiece--Jules Barbier and Michel Carre. Gounod was a master melodist and both operas leave one humming--a very good sign in our estimation. The opera hews rather closely to the Shakespeare play with a few minor changes and a few deleted characters. To suit the operatic mentality, the librettists chose to focus on the romance between the two young lovers. Nonetheless, in our day and age, with gun control and belligerence on the front page every day, we cannot fail to miss the major point that meaningless hostility between any two groups--be they religious, political, or cultural--leads to irreparable loss to all concerned. We got the message when, at the conclusion of the opera, the opposing parties lay down their swords. Would that all mankind would get the message! Returning to the issue of melody, the opera includes a breathtaking aria in waltz time for Juliette--"Je veux vivre"; one of our favorite sopranos Ailyn Perez performed this aria with technical mastery equalled only by the sparkle of youthful high spirits. During the course of the opera, Juliette must convey emotional growth from these adolescent high spirits to the solemn lifetime commitment to Romeo, through the panic of risk-taking to the ultimate grief of loss. These emotional changes were nicely negotiated by Ms. Perez whose instrument has a lovely silvery tone. Her phrasing is impeccable and her French, perfect. The opera has four duets occurring at different stages of the relationship between the two young lovers. Tenor Stephen Costello, whom we always enjoy, was at the top of his form, allowing his fine sound to soar with freedom of expression. Their two voices blended harmoniously in just the way we want a soprano and tenor to blend. His "Ah! leve-toi, soleil" was brilliant.. Mr. Costello is appearing at The Santa Fe Opera for the first time. We hope he will return. And what a pleasure it was to hear baritone Elliot Madore in the role of Romeo's friend Mercutio. His "Queen Mab" aria was delivered with vocal excellence and dramatic validity. It is too bad that Mercutio gets killed off so early! We would have to say that Mr. Madore owns this role and, if you miss him here in Santa Fe, you can hear him sing the role at The Metropolitan Opera in New York. 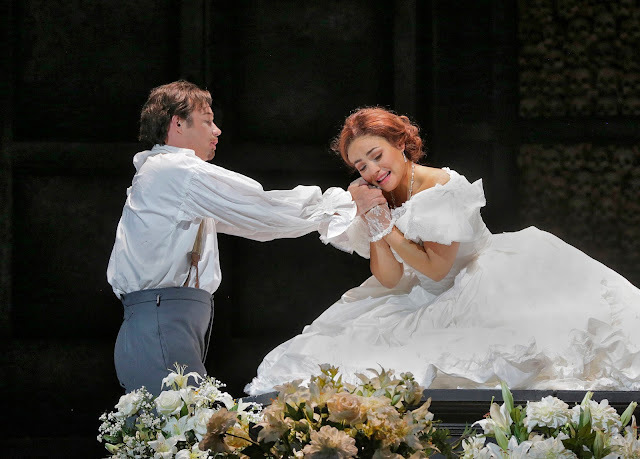 As the young page Stephano, mezzo-soprano Emily Fons impressed us as favorably as she did when she performed the role of Cherubino three years ago. But we didn't know she could dance! Bass Raymond Aceto whom we enjoyed as Wells Fargo agent Ashby in Fanciulla del West, demonstrated his versatility in the role of Frere Laurent. Mezzo-soprano Deborah Nansteel portrayed Juliette's nurse Gertrude and portrayed her successfully. The role of Tybalt was well-sung by apprentice Cooper Nolan whose versatile tenor was enjoyed Sunday night in the role of Stiffelio in the Apprentice Recital. As Juliette's father Count Capulet, baritone Tim Mix used his substantial instrument and stage presence to create a formidable character. In contrast with the superlative musical values, the production values were disappointing. Director Stephen Lawless chose to remove the story from its natural time and place--Renaissance Verona--and set it in Gounod's own period. Instead of civil unrest we had two opposing armies, one dressed in red, the other in blue. (Had they been blue and grey we might have been thinking of the American Civil War). In place of a monk in a monastery, we had a doctor in an army field hospital who took off his (bloodied) white coat and joined Romeo and Juliet in marriage right there in the hospital! Perhaps Mr. Lawless meant to create an abstract symbol for all such internecine wars. But in our opinion, it works better to stick to the specifics of time and place and allow the audience to generalize to their own situations. The costumes by Ashley Martin-Davis were gorgeous and we loved the way the chorus stripped away their mourning black to reveal white ball gowns. However, the 1860's fashions seemed terribly incongruent with the story and Ms. Perez' gown seemed quite inappropriate for an adolescent. As a matter of fact the voluminous fabric seemed to swallow her up. We were equally dismayed by Ms. Martin-Davis' set design. We seemed to be in some kind of mausoleum which might have worked for the final tomb scene but which did not work well for Juliette's residence. The walls were divided into squares, each bearing a name. Watching the opera from the 8th row, we could make out the names which was distracting. They were mostly British names. Did this mean we were in England? In America? Was there a body entombed behind each plaque? In truth, it looked like a morgue and we half expected the doctor to slide one open. But that didn't happen. What did happen was that doors opened and closed with singers entering and exiting. It made neither dramatic sense nor spatial sense. So once again we have reveled in the musical artistry and despaired over "concept". We will take our opera "neat", thank you, without the concept.